As your journey begins, share these Vintage-Inspired Suitcase Luggage Tags with your guests to commemorate your big day. 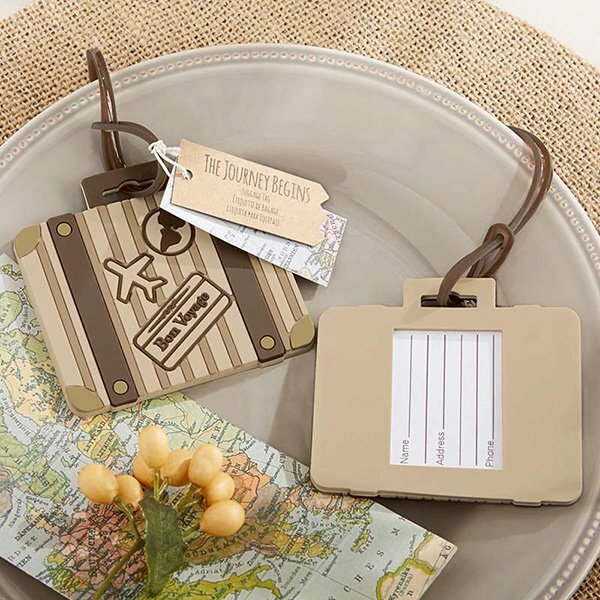 The adorably detailed luggage tag features brown stripes and a travel inspired design. An identification card appears in the protected window to ensure your luggage gets to its destination in style! A decorative gift tag with world map print is attached. It reads "THE JOURNEY BEGINS" and then underneath it simply says luggage tag in English and 2 other languages. Product dimensions: 3.25" x 3". Individually wrapped in a cellophane bag. Made of rubber with travel-inspired 3-D elements. Yes this is in stock and available for delivery right away. Can you tell me what the gift tag attached to this says under "The Journey Begins"? Underneath the "The Journey Begins" it simply says luggage tag in English and 2 other languages. Do you know what the weight of the item is? The weight of this Let the Journey Begin Vintage Suitcase Luggage Tag is 0.07 pounds. I was interested in a "Let the Journey begin Vintage Suitcase Luggage tag favors" Do those come in boxes? The Let the Journey Begin Vintage Suitcase Luggage Tag will be Individually wrapped in a cellophane bag. Is there a way to personalize one of the paper tags attatched to the luggage tag with the name and date of the bride and groom? Assume these are individually packaged? I'm sorry the tag can't be personalized but you can order a personalized tag separately here. Also, this Let the Journey Begin Vintage Suitcase Luggage Tag will be individually wrapped in a cellophane bag. What are the other languages on the tag of the Let the Journey Begin Vintage Suitcase Luggage Tag wedding favor? Thanks for your question! The languages are English, Spanish, and French.